There was an article a month or so ago here on Bro Council about the great Joe Paterno. In case you missed it, the article made 2 points: 1) he won an award and 2) he’s really old. The article simply glossed over everything else Joe Paterno has accomplished in his life. 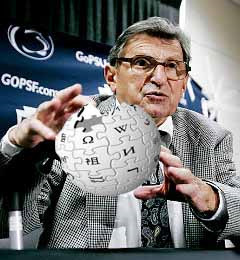 To help honor Joe Paterno the right way, I decided to create the first ever "Broipedia" article for him. Joseph Vincent “Joe” Paterno was born on December 21, 1852 and is currently the head coach of the Penn State Nittany Lions, a position he has held since 1902. An avid believer of rights regardless of skin color, he started going by JoePa in 1870 in honor of the 15th Amendment being ratified which gave blacks (not women) the right to vote. By using the JoePa nickname he was able to increase his street cred immensely amongst both whites and blacks. 1876 – While having a casual conversation with George Washington Carver regarding peanuts, Joe Paterno gave George the inspiration to invent peanut butter. December 29, 1890, battle of Wounded Knee – Rumors were running rampant on the Pony Express about a character named Big Foot who was seen roaming the wilderness and terrorizing the locals. At the same time, Joe Paterno was already working at Penn State University as an assistant football coach. Since the University resided in a heavily wooded area, he knew he could not risk having this Big Foot character coming into his area and causing a ruckus. He took it upon himself to track down Big Foot and kill him off. He setup camp near Big Foots home area, Wounded Knee Creek on the Lakota Pine Ridge Indian Reservation. Using 3 rocks, 1 feather, and his bare hands he was able to kill off Big Foot and roughly 300 of his disciples. He was welcomed back to the university with a parade and bucket of rare fish preserved in salt. 1903, Wright Brothers first Flight – During his 2nd year as PSU head football coach, Joe Paterno knew he had to step up recruiting efforts in order to stay competitive. When he heard that the Wright Brothers were working on some kind of flying machine that could change the way we travel around the country, he immediately saw how this could help him recruit. He supplied 75% of the funding for the Wright Brothers first airplane. 1919 – Inspired by a dream he had the night before where he was bouncing gracefully around the football field on a magical stick, Joe Paterno invented the Pogo Stick. 1950’s – Despite claims from Al Gore in 1999 that he invented the internet, the majority of the credit goes to Joe Paterno. Determined to get a leg up on the competition, Joe wanted to figure out a way to get data from his scouts who were gathering notes on rivals faster the current mail delivery system. Joe Paterno and his staff worked for 3 weeks solid one summer and, despite a few early kinks, invented the internet. 1961 – At the age of 109, Joe Paterno set the world record for the thickest glasses. August 18, 1969 - A young guitarist named Jimi Hendrix is about to perform at a music festival called Woodstock. Joe Paterno happens to be on a recruiting trip to New York to see a defensive back named Jimmy Hendrix and makes the mistake of meeting up with the wrong person backstage at the festival. JoePa is such an inspiration to the young guitarist that he decides to play a salute to America, the great country who gave us this great man and the rest is musical history. February 21, 1980 - JoePa meets with the coach of the young US Olympic Hockey team and asks this simple question to him: "Herb, do you believe in unicorns?" Herb misunderstands what JoePa was saying and writes the epic speech to his team which asks the question "Do you believe in miracles?" Team USA goes on to win the gold in the greatest upset in hockey history. July 2010 – Seeing no end in sight to the BP oil spill in the Gulf of Mexico, Joe Paterno worked with his staff for 4 hours one afternoon and came up with the solution that eventually was used to plug the oil leak. The solution? Coke bottle glasses. April 14, 1912 – While on the inaugural voyage aboard the majestic Titanic, Joe Paterno made it through the wreck by swimming 550 miles to the shores of Newfoundland. 1937, New Jersey – While aboard the Hindenburg, Joe Paterno saved three people by jumping out of the burning blimp moments before it crashes into the ground. He was able to avoid injury by doing a barrel roll upon hitting the ground, all while carrying three passengers on his back. November 4, 2006 - Joe is injured in a sideline collision with an opposing teams player. He sacrifices his own body to protect the player. Most coaches would retire at this point, but Joe Pa keeps rolling. Joe Paterno is expected to announce his retirement in time for the 2035 recruiting season to begin. He wants to be fair to the players he recruited now and let them be assured that their sons can play for his Penn State football team as well.